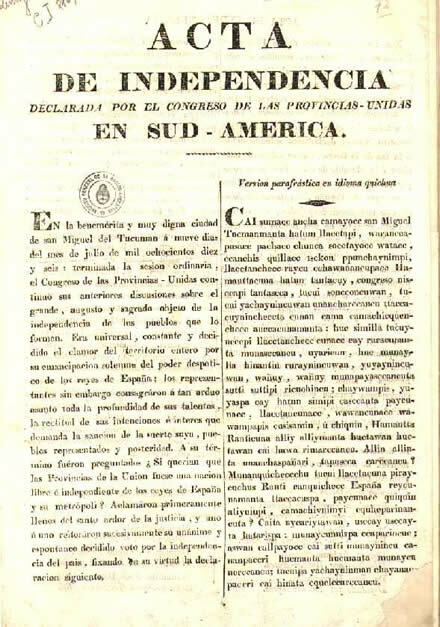 Argentina declares independence from Spain on July 9, 1816 by the Congress of Tucumán, the May Revolution of 1810 followed the deposition of the Spanish king Fernando VII by Napoleon. The revolution terminated the authority of the Viceroyalty of the River Plate and replaced it with the Primera Junta. When the king returned in 1814, Spain was determined to recover control over its colonies in the Americas. The royals were victorious at the battles of Sipe-Sipe, Guaqui, Vilcapugio and Ayohuma, in what had been the Viceroyalty of Peru. From there they planned to attack the bases of José de San Martín, and to make their way to Buenos Aires. On April 15, 1815, a revolution ended the mandate of Carlos María de Alvear and demanded that a General Congress be summoned. Delegate deputies, each representing 15,000 inhabitants, were sent from all the provinces to the sessions, which started on March 24, 1816. However, several territories that had until then belonged to the Viceroyalty of the River Plate did not send delegates: the Banda Oriental (“Eastern Bank”, today Uruguay), which was faithful to José Gervasio Artigas; Paraguay, which had already proclaimed its independence; and the Gran Chaco, still fighting the aboriginal resistance. The congress was inaugurated in the city of Tucumán, with 33 deputies. The presidency of the congress would be rotated monthly. Because the congress had the freedom to choose topics to debate, endless discussions ensued. The voting finally ended on July 9 with a declaration of independence. The president of the Congress at the time was Francisco Narciso de Laprida, delegate from San Juan Province. Subsequent discussions centered on what form of government the emerging state should adopt.